Yesterday Microsoft announced Windows 10 Insider Preview Build 18277 for the fast ring. It is interesting to follow these test release details as many of the features end up in general release for those who don’t want to participate in testing OS software for one reason or another. Key changes delivered in v18277 include; an improved Action Centre experience, an evolved Focus Assist functionality, Emoji 12 preparations, high DPI improvements, and camera / microphone toggles in Application Guard for Microsoft Edge. A nice change within the Action Centre of Windows 10 is the optional change of brightness setting from a button into a slider. 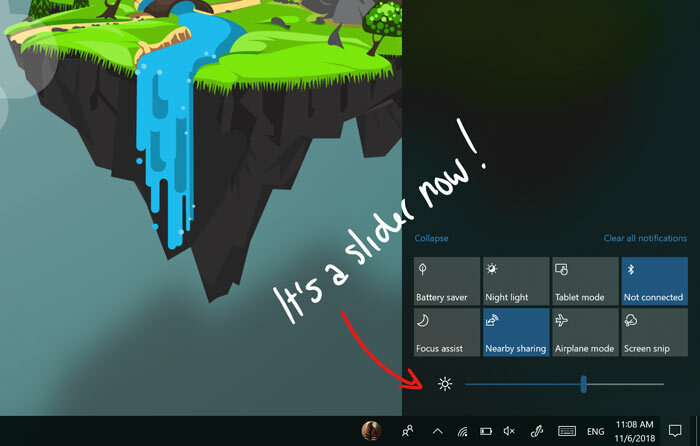 The current only choice in the Windows 10 Action Centre is a button which changes the display brightness in 25 per cent steps with each click. Users will get the option to switch that out for a slider in v18277 and onwards. For me I don’t remember changing brightness on the desktop in the office as the lighting is constant. It was set up when I bought and installed the monitor. On the laptop it’s a different story, but as it provides Fn hotkeys for brightness adjustment that I am used to, the Action Centre slider won’t be used so much. Elsewhere in the Action Centre Quick Actions can be customised in-situ. Users can, in this latest test version, move the buttons around and add any new buttons they might want in this pop-up panel. Focus Assist was delivered with the Windows 10 April 2018 Update, and has been tweaked in v18277. An extra setting has made the release which will not just blank out notifications when you are gaming in full-screen but in any full-screen app (perhaps watching a movie). 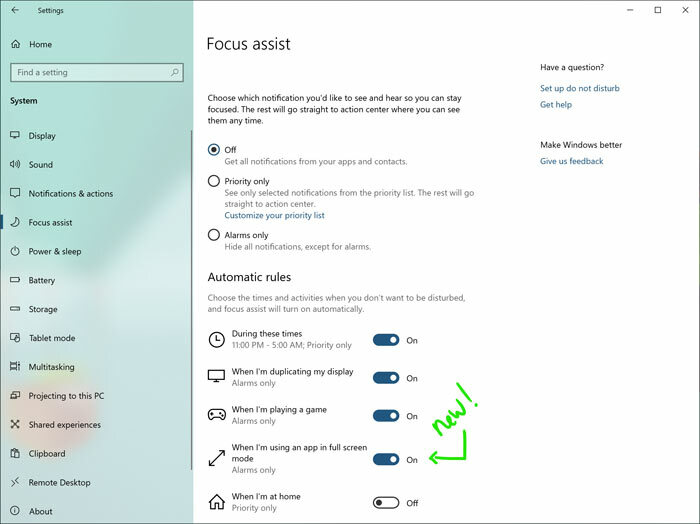 It’s worth checking the Focus Assist settings (see above) even if you are using the Windows 10 current general release – as you might not want it on at all. Lastly, Microsoft has implemented a few smaller changes. 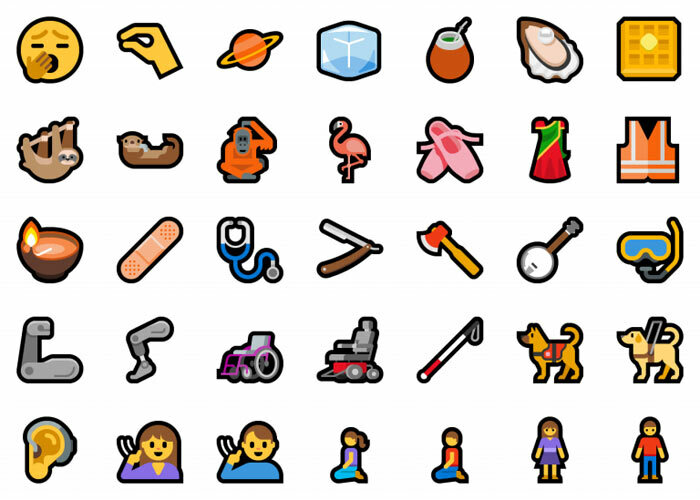 It is preparing for the Emoji 12 release by designing and including some new images, as shown above. Some minor high DPI improvements have come in advanced scaling options. Windows Application Guard for Microsoft Edge can now ensure your camera and microphone are switched on/off for additional browsing security. Japanese speakers and students of the language may also appreciate a cleaner, more polished, Japanese IME with increased security and reliability. If you head on over to the release info blog post you can see a long list of general changes, improvements, and fixes for PC (and remaining known issues) in this update too. The downside to this build seems to be that W10 Pro installations now activate as W10 Home - Quite the downgrade. I was hoping Action Centre meant a place to go and enjoy some cycling, walking, hiking, zip-lining and many other fun outdoor pursuits…!! Wait…WHAT?!!!! Really? WTF? Is it a bug or did they say why? This issue* is affecting pretty much everyone, not just Insiders. *Windows de-activating itself and saying your Pro license is actually a Home license.